Shavua tov and chag sameach – happy Sukkot! Shavua tov – a good week to you — and chag sameach (a joyous festival): it’s Sukkot! This coming Shabbat services will be led by Rabbi Rachel, and we’ll read the Torah reading for Shabbat when it falls during the intermediate days of Sukkot. All are also welcome to join us at 5:30pm on Friday evening for our annual Shabbat / Sukkot potluck in the sukkah (if it rains, we’ll dine indoors) which will be followed by an optional sleepover in the sukkah — please RSVP for both so we know how many people to expect. As in years past, we are asking you to fill out a short survey about your experience during the Days of Awe at CBI. What was good for you / what did you like during the Days of Awe at CBI this year? You can fill out the survey anonymously here: Days of Awe Survey 5776 / 2015. Wishing everyone a sweet Shabbat! I’m doing something new with our b’nei mitzvah kids this year. (Credit where it’s due: this is an idea I adapted from my friend and teacher Rabbi Burt Jacobson of Kehilla Community Synagogue in the Bay Area.) It’s called Mitzvah Experimentation. I brought this to our seventh graders in our first Hebrew school class of the year. The first thing we talked about was, what’s a mitzvah. Some of them said “good deed,” which is a fine answer, though not a direct translation. Others said “a commandment,” which is what the word mitzvah means. A mitzvah is something which we are commanded to do, or to not do. Commanded by whom? The most traditional answer is God. That word raises some eyebrows. Not all of my students are certain that they believe in God. What if you don’t believe in God — does that scotch the mitzvot? There’s a story about Reb Zalman z”l, the teacher of my teachers, faced with someone who didn’t believe in God. He asked that person to tell him about the God they didn’t believe in. Because “maybe the God you don’t believe in, I don’t believe in either!” Over the millennia we’ve thought about God, talked about God, and described God in all kinds of different ways. Some of those ways work for me. Some don’t. Some might work for you; some might not. The name “God” can mean a lot of different things. And if my students want to talk about that, I’m happy to do so. The Hebrew word mitzvah is related to the Aramaic tzavta, connection. A mitzvah is something which connects us. Doing mitzvot is what our ancestors did — maybe our genetic ancestors, and maybe our spiritual ancestors who lived Jewish lives in eras before our own. Doing mitzvot can be be a way of investing one’s life with meaning. And I believe that doing mitzvot can connect us with God — though each of my students is going to have to figure out what that means to them. Are these reasons important enough to merit taking on the mitzvot? 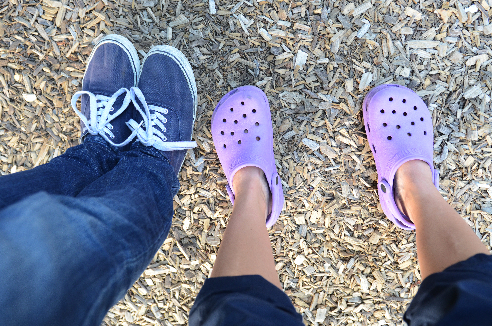 Our b’nei mitzvah students won’t know until they try them on. That’s what mitzvah experimentation is about. I gave my students a list of twenty mitzvot. Ten are mitzvot bein adam l’makom, between a person and God, and ten are mitzvot bein adam l’chavero, between a person and another person. Praying in community, fasting for Yom Kippur, lighting Shabbat candles, studying Torah, building a sukkah next week and then rejoicing in it — these are mitzvot bein adam l’makom, mitzvot which take place in the space between us and God, us and our Source. Feeding the hungry, as we do each month when our Take and Eat volunteers cook meals for 200 homebound seniors who would otherwise go hungry; giving tzedakah; making a conscious effort to respect one’s parents, both inwardly and outwardly — these are mitzvot bein adam l’chavero, between one person and another. Each kid will choose two mitzvot from each list, and will dedicate one month of the school year to practicing each mitzvah. After spending a month immersed in each of their four chosen mitzvot, each student will give a report to the class about which mitzvah he chose, how he practiced it, what the experience was like for him, and how the month-long experiment with that mitzvah changed him. The sages of our tradition seized on that phrase. What does it mean to say “we will do and we will hear” — wouldn’t you think it would be the other way around? If I tell my child to get dressed for school, he has to hear my words before he can do what I’ve asked. It’s not fair to expect him to do the thing before he hears me, is it? Even if we expand the definition of “hearing” — maybe it’s not about literally hearing the instruction, but about understanding it — the verse is still tricky. Surely it’s better to understand something before one tries to do it? Jewish tradition says otherwise. Jewish tradition says, sometimes we have to do in order to understand. This is a dance which has been going on for thousands of years. It’s as old as Judaism, and so is this question: when we dance with the mitzvot, when we dance with God, who “leads”? How much of it is dictated by our Partner, and how much depends on us? And what matters more: doing the steps without mistakes, or doing the steps with heart? In the early centuries of the Common Era our sages argued: is it better to recite the words of the Shema perfectly without feeling their meaning, or is it better to focus on feeling the meaning even if one errs in saying the words? And relatedly: should one wait to say the words until the feeling is there? The same questions might be asked of what we’re doing today. Is it better to recite the prayers of Yom Kippur without feeling their meaning, or to focus on feeling the meaning even if we don’t say all of the words? Should we wait to say these words, or wait to fast, until we “feel like it”? What if we never “feel like it”? The tension between doing and feeling does matter. We don’t want our religious lives to be dry structures with no heart in them. But we also don’t want our religious lives to unfold only when the feeling is already there. Sometimes we need to do in order to feel. We hear the music in a different way when we give ourselves over to the dance. I don’t know what our bar mitzvah boys (and yes, this year they’re all boys) will feel, or understand, or experience, as they try on different mitzvot. I’m looking forward to learning from them. Try a new mitzvah this year in solidarity with our bar mitzvah boys, and model for them what it’s like to be an adult who’s still learning and growing. Or try a mitzvah you’ve done before, but do it now in a more sustained way. And then make an appointment with me, and tell me how practicing that mitzvah has changed you. If you are like me — and I suspect that you are — you may be feeling some discomfort around the idea that a practice will change you. It sounds like giving up agency. It sounds like admitting that you need to be changed. Maybe, like me, you’re thinking: but I don’t want to change. I like myself how I already am. I don’t need to be changed. Actually I’ll bet it’s not even going to change me. We all feel that resistance. Even the rabbi. Change is hard, and accepting that we might need to change is even harder. We can all come up with a million reasons why we are the way we are, why our existing habits suit us, why we can’t possibly do things differently. Yom Kippur comes every year to remind us that change is not optional. Without change, there is stasis, and stasis is death. Yom Kippur comes to remind us that our habits of body, heart, mind, and soul become calcified and constricting. That each year we miss the mark in our habitual ways, and each year we have the opportunity to break free from those habits and become someone new. Our sages see Yom Kippur as a rehearsal for our death. Some of us wear white, like the burial shrouds in which we will all someday be buried. Many of us fast from food and drink, as those who have died no longer savor the tastes of this world. We recite a vidui, a confessional prayer, as we will recite a vidui on our deathbeds. 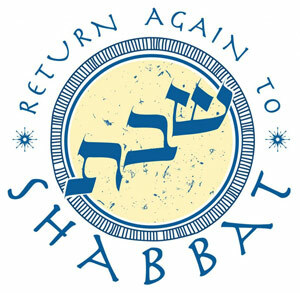 The sages say, make teshuvah — repent; return; align yourself with God again — on the day before your death. We never know when the day before our death might be, which means we should be making teshuvah all the time. If you knew you were going to die tomorrow, what in your life would you wish were different? What would you wish you had changed while you still had the chance? What are the truths you’ve been afraid to speak — to yourself; in your relationships; to God? If you knew you were going to die tomorrow, would you feel free to speak them at last, so you could leave this life with a clean slate and light heart? Yom Kippur comes to urge us: speak those truths now. Don’t wait. Every day is an opportunity to wake up and to shake off old fears and old habits which no longer serve us. Every day is an opportunity to live more fully into the mitzvot, and to let the practice of mitzvot change us. And because it’s human nature to resist change, our tradition gives us Yom Kippur as a day dedicated to this uncomfortable life-changing work. Yom Kippur calls us to face ourselves, in all of our imperfections and with all of our resistance. Today invites us to ask: what are we so afraid of? Are we afraid that we’ll have to admit to ourselves that we could have been better people, we could have been truer to ourselves, we could have lived with more mindfulness and more integrity and more connection with God every moment of our lives until now? Are we afraid that we’ll have to admit to ourselves that we’ve sold ourselves short, that we’ve been settling for less, that we’ve taken the path of least resistance instead of seeking continued change and growth in our lives? What’s worse: having to admit that I could have been better before now, but committing myself now to embracing my changes and the fullness of who I can be — or refusing to admit that, and therefore never growing, never changing, never deepening my spiritual practice or my relationships or how I am in the world? Surely, this mitzvah that I enjoin upon you today is not so wondrous for you, and it is not so far. It is not in the heavens that one should say, “Who shall go up into the heavens for us and get it for us that we will hear it and do it?” It is not over the sea that one should say, “Who will cross over to the other side of the sea for us to get it for us that we will hear it and do it?” The word is very close to you, in your own mouth and in your heart to do it. The mitzvot are right here within our grasp. They will change us, if we let them. Just as life will change us, if we let it. Everything we experience offers us an opportunity to become more conscious, more compassionate, more mindful. Every mitzvah invites us to let go a little bit, and to let something greater than ourselves in. Our people’s dance with the mitzvot has been going on for thousands of years. The dance is what changes us: not necessarily any given set of steps, but the fact that we’re willing to take the risk of entering into the dance, and to keep dancing. Na’aseh v’nishmah. “We will do, and we will hear.” Yom Kippur calls us to do. Do, and then listen for the still small voice of your own soul. Do, and then hear. Dance, and let yourself be changed. That’s a riff off of a famous phrase. Originally the teaching was that forgiveness is letting go of the dream of a better past. Depending on who you ask, it either comes from the actor Lily Tomlin, or from noted Jewish-Buddhist teacher Jack Kornfeld. Either way, I think it’s equally true of teshuvah. An essential part of teshuvah, of re/turning ourselves in the right direction again, is letting go of wishing that the past had been different. We all fall into the habit of wishing that things had been different. We tell ourselves stories about how much better life might be if we had made different choices, or if we hadn’t been dealt a particular hand of cards. There’s nothing wrong with the mind telling stories. That’s what it was designed to do. We are meaning-making machines. We take in life experience and our minds strive to make meaning from them. But it’s easy to get so caught-up in the stories that we lose sight of the present moment. And it’s easy to get so attached to our stories that we get stuck in them. Who am I, really? If I set aside all of my “if onlies,” what am I left with? If I set aside my stories about who I used to be, and my stories about who I might become, who am I right now? Yom Kippur begins tomorrow night (Tuesday, Sept. 22) at sundown. I’m writing today to share with you explanations of a few of the customs of Yom Kippur — adapted from and expanding on teachings from Rabbi Marcia Prager. A schedule of our Yom Kippur observances can be found at the end of this note. Some say that we wear white on Yom Kippur as an approximation of the white garments in which we will be buried. (Some of us may even wear a kittel, a simple white cotton robe, which is worn at marriage and for burial. You will see Hazzan Randall in his kittel during the holiday.) As members of our chevra kadisha (volunteer burial society) know, every Jew is buried in the same simple shroud: plain white garments, the same for everyone, men and women, rich and poor. Wearing white is a reminder of our mortality and our equality in the eyes of God. On Yom Kippur, wearing white garments which remind us of the garments we will wear when we die can serve as a reminder that we stand every day on the edge of life and death. Others teach that we wear white on Yom Kippur to be like the angels. We yearn to ascend, to be lighter, more clear and transparent. White is a color of holiness and celebration — that’s why we only have white kippot / yarmulkes available during the holiday season. Why do some Jews avoid wearing leather on Yom Kippur? There is a custom on this day of avoiding wearing anything made of leather, because leather requires the death of a living creature. On this day when we make our most fervent teshuvah, we don’t want to be garbed in something which required another being’s death. For this reason, you will see some people wearing canvas shoes, or even rubber Crocs, instead of leather shoes. Another interpretation is that we substitute soft shoes for leather on this day because we want to remove what protects us. The physical act of wearing soft shoes evokes the emotional / spiritual act of removing the covering from our hearts, allowing ourselves to be vulnerable on this day. And, of course, you will also see others for whom these interpretations are not meaningful, and who do wear leather, and that’s fine too. Our congregation includes people with many different relationships to halakha (the “way of walking” sometimes translated as “Jewish law”) and to minhag (custom) — and we bring with us many different minhagim (customs) from our communities of origin, too. Why do we wear a tallit at night for Kol Nidre? Kol Nidre evening is one of the very few times in the Jewish year when a tallit is worn at night. (Though it should be donned before sunset — like the singing of Kol Nidre itself, which also must happen during the day, before Yom Kippur technically begins.) Ordinarily a tallit is only worn when it is light out and we can see the fringes. 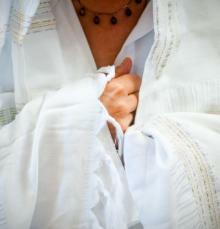 There are many reasons why the tallit is worn at this unusual time of day. One is that we sing the Thirteen Attributes (“Adonai, Adonai, El Rachum v’Chanun”) at Kol Nidre services, and there is a very old custom which holds that a tallit should be worn when these are chanted. Another reason is that tallitot are frequently white, and when we wrap ourselves in white tallitot, we can see ourselves as being like the angels, garbed in white light. For some, a tallit is also worn as a sign of transcendent consciousness; for others the tallit can be a stark reminder of death and the transient nature of physical existence, as the dead are sometimes buried in a tallit in addition to the simple white garments and kittel. 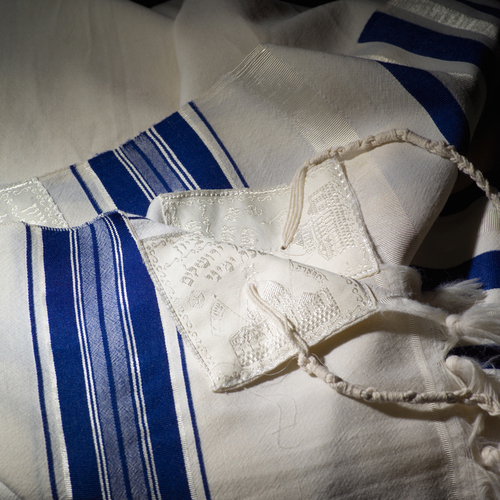 Perhaps we wear tallitot at Kol Nidre because on that night, the “light” of our prayers and our connection with God burns so brightly that it illuminates us from within, and we can see our tzitzit gleaming in that holy light. A final reason is this: we take the Torah scrolls out from the ark for the Kol Nidre prayer, to insure that our prayers are linked to Torah. The person leading the prayers at that time is flanked at both sides with people holding Torah scrolls. This is done to mimic a court, a “beit din” of three, as a beit din court is needed to annul vows. And when the scrolls are removed from the ark, it is traditional to wear a tallit. Our observance at CBI will begin at 5:30pm tomorrow evening with beautiful music to stir the soul (violin, cello, and piano), followed by Kol Nidre at 6pm. On Yom Kippur morning we’ll gather to daven (pray) the morning service at 9:30am. Yizkor (the memorial service) will take place at the end of morning services. Then we’ll regroup at 3pm for an introduction to Jewish contemplative practice (no experience required), 4pm for Avodah and Mincha services (including a radio play about Jonah! ), and 6pm for Ne’ilah (the closing service of the day), with our Break-the-Fast scheduled for 7pm. Join us in wearing white; join us in song and prayer; join us in whatever ways will most speak to your heart and soul this year as Yom Kippur unfolds. Wishing everyone a g’mar chatimah tovah — may we be sealed for goodness in the year to come. This year’s Rosh Hashanah theme was “Seeking and finding.” Ron Turbin and Suzanne Graver offered the sermons on erev Rosh Hashanah. With their permission, we share those sermons with you now. G’mar chatimah tovah – may you be sealed for good in the year to come! I feel honored to have been asked to speak tonight on the theme of “Seeking and Finding” and want to thank Rabbi Rachel for having asked me. I accepted without hesitation, regarding this as an opportunity to thank CBI for enabling me to return to being a practicing Jew. I’ve chosen as my starting point an incident that’s haunted and puzzled me for many years. Preparing for this talk, I’ve come to discover why. To which I replied, “Where I belong right now is home, where I have a very sick new-born baby, so please let me leave,” and drove off. Nonetheless, this question of “Where do you belong” haunted me for years to come and in ways that went beyond the customary issues of having to deal with anti-Semitism or Jews experiencing themselves as outsiders. It troubled me because Knowledge is what I’ve spent most of my life actively seeking and this very search had at key moments in my life separated me from my Jewish inheritance and identity. During my childhood years, my Jewish identity was as strong as could be. I loved my family’s way of being Jewish, the joyful and delicious holiday meals, the stories from the Old Testament, the poetic invocations of nature in the prayer books, the calls for truth and justice, compassion and love, forgiveness and redemption. Each year, I eagerly awaited Kol Nidre, a service my father and I typically attended together. My family is Sephardic, both my parents having both been born and raised in Turkey, where my ancestors fled in 1492 to escape the Spanish Inquisition. My family is proud of its Sephardic history, as am I. Ladino was my first language. When in 1921, my maternal ancestors left Turkey to “move back to Spain,” as my mother put it, my grandfather became the Shamash (custodian) of the first synagogue in Barcelona since the Inquisition; and for many years, until a Rabbi could be found, he conducted the services. My mother and her family lived in the building that housed the synagogue. She sewed the tallit (the prayer shawls) and embroidered the cloth that covered the Torah. My two oldest brothers carved their initials into the backs of the benches. After my mother moved to America, she and my father helped to found a synagogue in the Queens neighborhood where I grew up. My ambivalence about Judaism began when I was about eleven and was not allowed to learn Hebrew or engage as fully as my four brothers in religious practices that they seemed to care about far less that I. My alienation intensified when I found among the few books in my house a Siddur with English translations of Hebrew prayers and found: “Blessed are You, Hashem our G-d, for not having made me a woman,” a prayer recited by men at the morning service. When I went to college, I became enraptured by the ideas I encountered in my Great Books of the Western World courses and asked my Rabbi for the names of equivalent great Jewish thinkers. He told me there were none. I didn’t discover until quite a bit later how very wrong he was. Struggling to ease my quarrel with Judaism, I took two courses in Jewish history at Queens College and found that neither did they include profound writings by Jewish thinkers. My switch from history to literary studies in graduate school opened a wider door for me when I chose to write my Ph.D. dissertation on George Eliot, a world-class female Victorian novelist who used a masculine penname so that her books would be taken seriously. Though not Jewish, she championed Jews and Zionism. Her early work included translating Spinoza’s Ethics into English, leading me to read the work of a brilliant Jewish philosopher whose writings should have been included in my Great Books courses and were not. George Eliot’s later work included Daniel Deronda, a novel in which she created at considerable risk a hero who discovers his Jewish identity and ultimately abandons the life of a British gentleman to go to Palestine and work towards the establishment of a Jewish State. George Eliot published this novel in 1876, several years prior to the first Zionist settlement in Israel and two decades before Theodor Herzl launched political Zionism. The concluding chapter of my book, George Eliot and Community, is devoted to this novel. This work began in me the process of uniting my quest for knowledge with my search for a Jewish identity that didn’t separate me from myself. Believe it or not, my quarrel with Judaism lessened considerably when, shortly after I started to teach at Williams in 1978, I added Women’s And Gender Studies to my scholarly research and teaching. Doing so enabled me to see what I truly had not known before: that most of the great Western thinkers I’d been so seduced by during my undergraduate years regarded woman as innately inferior to man on the grounds that her ability to reason is vastly inferior, a view that for centuries justified woman’s exclusion from both the Republic of Letters and equal rights. My undergraduate reading assignments and class work left this out, making me feel retrospectively somewhat brainwashed. Orthodox Judaism’s exclusions of women from certain types of mitzvoth seemed benign, in comparison, grounded as they are in woman’s responsibility to care for her children. Still, not until I joined CBI did I truly begin to unite what had often felt like separate selves. The services I’ve attended here, the Hebrew chanting and melodies that return me to my past, the book group meetings, the spiritual study sessions, the delightful parties have all contributed to this. Beyond this, CBI connects me to my childhood love of Judaism by speaking to my adult spiritual needs, which include but also transcend my lifelong search for knowledge. “Jewish renewal through spirituality” constitutes not only CBI’s guiding principle but also its practices. In countless ways and at innumerable moments, transcendence gets embodied here. Torah explications connect the sacred with the everyday, often in breathtaking ways. Rachel’s music makes me think I’m hearing David’s lyre, invoking Paradise, as does Randall Miller’s magnificent cantorial voice. It’s not that paradise and spirituality had been entirely missing from my adult life before I joined CBI. I have often found their intimations in classical music, literature, and art; in nature and in my garden; but most of all in the love that my husband, my children, grandchildren, and I have truly been blessed to have shared. The new liturgy that CBI is using for the Days of Awe identifies “the broken heart” as “the master key . . . that opens the secret meanings behind all the shofar blasts. ” I joined CBI 5 ½ years ago, immediately after my husband died. I’m more grateful to CBI than I can possibly say for helping my broken heart to heal by enriching my spiritual life and giving me the gift of a communal place where I belong. I’d like to thank Rabbi Rachel for inviting me to speak this evening. It’s a great honor. I’m very grateful to be here this evening and be a part of this wonderful congregation. Thank you. I think that the topic that we were asked to speak on is terrific. “Life as a journey; what am I looking for.” It’s perfect for me. Having reached a very significant decade this year on my birthday, December 25th, it is something that I think about. So, I’ll talk about my spiritual journey and hope that I don’t bore you. My parents jointed a synagogue a few years before my bar mitzvah, and, indeed my twin brother and I attended Hebrew and Sunday school and had our bar mitzvah. But then my parents dropped out of the synagogue and that was it. I didn’t think about synagogue or religion for the next twenty years. Then, I married my wife, Judy, a wonderful person and a practicing, church going Christian. Being curious about this important part of her life, I began occasionally attending the Methodist church with her and my two older (step) children. It was a lovely and welcoming Congregation. Consequently, despite my ambivalence about being in a Christian church, I received spiritual nourishment from the experience. This led me to the obvious. Well, if I am receiving spiritual sustenance from a church, why not return to the synagogue. Which is what I did. I found a very friendly, warm congregation in my community in Long Island and enjoyed attending regular Friday night, and occasionally Saturday services. In many ways I found my wife’s congregation and my new Jewish congregation, with respect to friendliness, community involvement and simplicity of worship, similar. However, these basically positive experiences were not without disillusionment. Regarding my wife’s church. One day friends whom we made in the Church told me that they were very disappointed that I would not be joining them in heaven because I was not a Christian. Of course, I did not take their remarks, although stated sincerely by them, seriously or personally. However, I was shocked that intelligent people attending a fairly liberal church should have such a parochial view of salvation. I then suffered a much more personal disillusionment with the synagogue. After the birth of our youngest son, Jonathan, I decided that I wanted to raise him Jewish. When he was four years old, I approached my Rabbi, and asked how I could transition him to the synagogue and Religious and Hebrew school. The Rabbi asked whether he was circumcised, which he was. Then, he asked whether the doctor who circumcised Jonathan was Jewish. He was not, although his partner was. However, that didn’t make a difference. The Rabbi said that he would have to be re-circumcised in order to join the synagogue. Of course, that was out of the question for my wife and I to recircumcise our four year old son. Again, I didn’t take this personally. But I was again struck by the arbitrariness of the judgment of the validity of my son’s circumcision. To the say the least, this was an example of ritual taking precedence over my desire to bring a member of my family into the Jewish faith. Just an addendum. There is a happy ending to this story. After my disappointment, I sought out counseling from another local Rabbi. He advised me, very sagaciously, not to separate Jonathan from his mother and siblings with respect to religious observance, and that he should attend church with his mother and siblings. However, he strongly recommended that I maintain a Jewish presence in the home, i.e,, light candles on Friday evening and observe the holidays. He predicted that, in the end, if I maintained a Jewish presence in the home, Jonathan may ultimately identify himself as a Jew, and this is exactly what happened. All of these experiences, many of which have been positive, but some disillusioning, have not dampened my belief in God and the importance of fostering a strong religious and spiritual component to our lives. However, now that I am closer to the end of my spiritual journey, I believe more than ever in the importance of the universal aspect of spirituality. We are all in this world and in this life together. Everything we do impacts everyone else. Likewise, the actions of others impact us. Yes, we take this journey alone, but there are millions of others who are fellow travelers. With this in mind, specific practices and rituals of diverse cultures and religions, while perhaps having some significance for individuals, pale in significance to our interconnectivity with each other and the earth that we inhabit and the realization that our actions, individually and collectivity, have a profound impact on humanity and the world that we inhabit. We must keep in mind that everyone is the world is blessed with a unique and beautiful individuality. It is, therefore, obvious that each person has his or her individual image of God and the divine, and I believe that we can include in that, the atheistic or agnostic view. At some recent point in my spiritual journey, I decided that my favorite book of the bible is Job. (Very interestingly one of the candidates running in the presidential primaries also referred to Job as his or her favorite book.) In the book of Job, God clearly reprimands Job’s friends for insisting that they know the ways of God (this is a good lesson for the fundamentalists in all faiths who while speaking knowingly of what is God’s will, often wreck havoc on the world). The moral that I discern from Job is that one simply cannot know the why and what of God, except that we all have a responsibility to serve each other and do what we can to create a better world and a better life for the other.